In November of 1997, NASA and the Japanese Space Agency launched a joint satellite mission with the goal of monitoring rainfall in the tropical and equatorial regions of the world—the Tropical Rainfall Monitoring Mission (TRMM). Its operational objective is to provide more information about where and when intertropical convective precipitation occurs, particularly over oceans, which are not monitored by weather stations and rain gauges. The mission is also designed to document how rainfall formation occurs within rain clouds in the intertropical region. Still in operation in 2009, the mission has successfully provided large volumes of information on rainfall amounts and locations as well as the structure of storms and cyclones over its long lifetime. 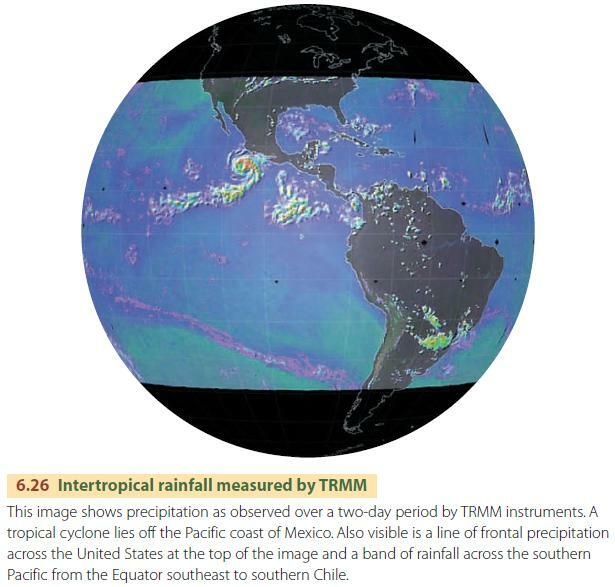 Figure 6.26 shows an example of how TRMM measures precipitation. The TRMM satellite has a unique orbit, covering only the region from 35° N to 35° S latitudes. With a low altitude and a short orbital period, the platform’s instruments sample the complete daynight precipitation cycle over land and ocean surfaces in this region. In this way, scientists have accumulated accurate statistics about rainfall frequency.